Immediately after the UK electorate voted to leave the EU the pound fell sharply. It remained weak and reached a low of $1.20 against the US dollar in January 2017. To date the steady recovery has brought the pound to $1.43, back to levels seen in the weeks building up to the referendum result. Overreaction following Brexit – it is typical for market participants to overreact to unexpected events. Market participants price known risks with logic, but react to uncertainty with a primordial state of fear. As uncertainty recedes prices generally recover. Robust economic data – elevated fears of job losses have not materialised and in fact, strong UK employment figures and a welcome uptick in wage growth has occurred. US Dollar weakness – better economic growth outside the US economy has weakened the US dollar (down 9.9% in 2017 on a trade-weighted basis), and the UK government managing to pass through stage 1 of Brexit negotiations has helped improve confidence. The importance of exchange rates? Whilst we know the benefits of a strong domestic currency when travelling abroad, there are other ripple effects to the wider economy. The exchange rate between two countries reflects the balance of buyers and sellers. One of the major reasons for buying and selling foreign currencies is to facilitate trade in goods and services (imports and exports). If a country begins to export more, the currency after a period will tend to appreciate (all else being equal). For the UK, a weaker pound, post-Brexit, has made goods and services cheaper thus stimulating UK exports and supporting economic growth. This has caused demand to increase and sterling to appreciate in 2017 and in recent weeks. Another motive is international flows of capital. Companies wishing to invest in a country are likely to be buyers of the currency as they bring capital to build assets. What level should the Pound be at? A popular economic theory for assessing exchange rates is Purchasing Power Parity (PPP). This theory asserts that movements in an exchange rate should offset any difference in the inflation rates between two countries. In other words, £10 in the UK should buy as much as £10 exchanged into US dollar and used to purchase goods in the US. PPP is generally very stable with currency relationships existing in a state of equilibrium. However, in foreign exchange markets currency prices move minute by minute and can often become significantly detached from their equilibrium level. We can illustrate this in the chart below. The PPP relationship between the pound and US Dollar, the dotted line, shows a very stable relationship historically; the equilibrium level being in the region of $1.4 to £1.0. However, apart from 3 brief periods, from 2001 to 2002, in 2009 and briefly again in 2016 the pound has departed wildly from PPP. Arguably, its highest overvaluation level was in Q4 2007 with a 45% misalignment relative to PPP. As mentioned one of the reasons why exchange rates can depart from their perceived fair value for long periods of time is the impact from huge rises in capital flows. Other influencing factors can be the appearance of a large current account deficit from the respective country which causes markets concerns about how a growing deficit can be financed, reducing the appeal of the currency. 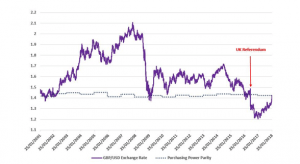 Whilst PPP has many limitations, it does provide a barometer of the fair value of sterling against other currencies, such as the US dollar in this instance. The recent rally of the pound highlights that we are now approximately near its fair value relative to the dollar. Better news for those looking to cross to the other side of the Atlantic on holiday or on business in the near future! The UK Chancellor of the Exchequer, Philip Hammond, told Bloomberg at the World Economic Forum in Davos that he is very happy where the currency is at the moment. He said, “Getting that inflation rate down helps to drive increases in real wages and (a rising pound helps to do that) and that’s good for our economy and good for our society”.